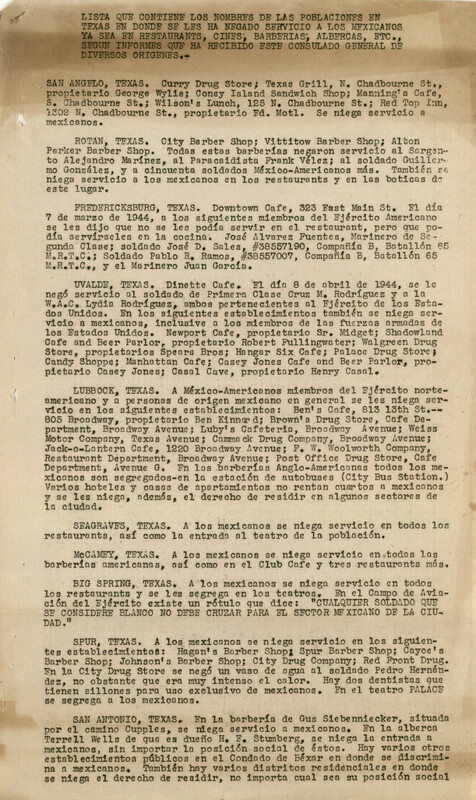 A list of locations where Mexicans were denied service, from the Alonso S. Perales files, 1940s. The digital collection formerly called Photographs from the Alonso S. Perales Papers has been expanded and renamed Selections from the Alonso S. Perales Papers. In addition the the previous published photographs, the collection now contains documents that further highlight Perales’ life and career as a civil rights lawyer, diplomat, and political leader. 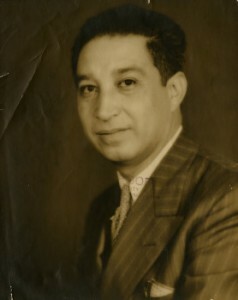 Alonso S. Perales (1898-1960) was one of the most influential Mexican Americans of his time. Perales saw himself as a defender of la raza, or race, especially battling charges that Mexicans and Latin Americans were inferior and a social problem. Perales was one of the founders of the League of United Latin American Citizens (LULAC) in 1929 and helped write LULAC’s constitution, and he served as the organization’s second president. An intellectual who firmly believed in the law, Perales wrote about civil rights, religion and racial discrimination, which he argued “had the approval of the majority.” His work included the pamphlet “Are We Good Neighbors?” and the two-volume set, “En defense de mi raza.” A member of the American Legion and the San Antonio Chamber of Commerce, Perales was also a columnist for “La Prensa” and other Spanish-language newspapers. 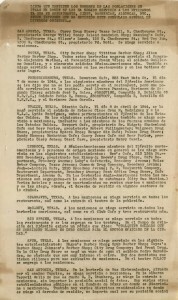 View the complete collection in the UH Digital Library, or learn more about the conference that accompanied the release of the original digital collection, In Defense of My People: Alonso S. Perales and the Development of Mexican-American Public Intellectuals. Both positions involve arranging and describing archival collections as their primary responsibility. Fellows will also supervise students in these tasks and provide support for reference service and digital projects. For more information about the fellowships, the University, and the city, visit the links above. Candidates must be able to begin work no later than Monday, August 27, so apply soon! Hurricane season is here, and people up and down the Gulf Coast have started crossing their fingers that we’ll be spared a major storm this season. That includes those of us in the Houston-Galveston area. Galveston is most know for the powerful storm of 1900 that devastated the island and killed more than 10,000 people. After that storm, the city built the seawall, which was tested when the hurricane of 1915 hit the island. While the 1915 storm caused $50 million worth of property damage, only 275 people lost their lives — not a trivial number, but a far better outcome than in 1900. To see more photos of the hurricane damage and repairs, take a look at the Galveston 1915 Hurricane Photographs in the UH Digital Library, taken from the collection of the same name located in UH Special collections.